Clustered Sedge (Carex glaucesens) is another sedge, like the previously profiled False Hop Sedge, that defies the stereotypes that sedges are all small, green, boring, and indistinguishable. Also known as Southern Waxy Sedge, is an wet understory sedge of the Southeastern US but doesn't go far south into Central Florida1. It's restricted to the panhandle, Northeast Florida, and Lake County. C. glaucescens was described in 1824 by botanist Stephen Elliot2. 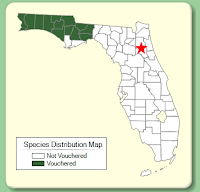 It is vouchered for 26 out of the 67 counties in Florida. Clustered Sedge is within the Glaucescentes section of the Carex genus3, which mean that it is closely related to other chunky-fruited Florida sedges: Cypress Swamp Sedge (C. joorii) and Warty Sedge (C. verrucosa). Skyblue Lupine's flowers are fading in Central Florida and the fuzzy seed pods are becoming prominent yet this amazing pollinator plant is in peak bloom in North Florida. Just like the White Wild Indigo profiled last week, Skyblue Lupine is a legume, meaning it associates with nitrogen-fixing bacteria and has a certain "beany" flower shape. 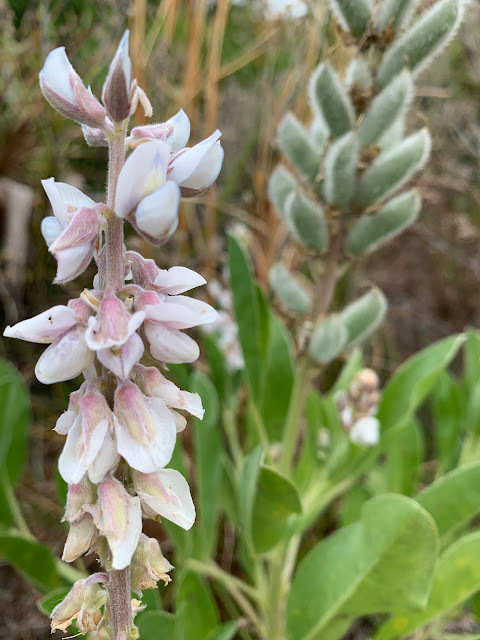 Skyblue lupine has a long, sensitive taproot and likes dry soils, so is found in sandhills, scrubs, openings in xeric hammocks, and dry flatwoods. It is very difficult to transplant and grow from seed so it is not available from nurseries for your home landscape or for restoration. It's leaves are eaten by the Frosted Elfin (Callophyris irus) butterfly, which is Listed Endangered in Florida1. It's also eaten by Grey Hairstreak (Strymon melinis) larvae, Genista Broom Moth (Uresiphita reversalis) larvae and many other butterflies and moths that use members of the Fabaceae family. False Hop Sedge (Carex lupuliformis) is now blooming. This species is often found in floodplain forests and wetlands of Florida throughout the Eastern US all the way to Eastern Canada1,2. Members of the Carex genus (sometimes called Carices) have interesting flowers that are often overlooked. False Hop Sedge has both male and female inflorescences, as visible in the following photo. C. lupuliformis was described in 1848 by physician-botanist Henry Sartwell3 and was published in 1850 by botanist and anti-slavery activist Chester Dewey4. It is vouchered for 46 out of the 67 counties in Florida. It has been documented in iNaturalist along Arbuckle Creek, the Myakka River, the Econlockhatchee River, Trout Creek (Hillsborough), the Hillsborough River, Tootoosahatchee Creek, Long Branch (Orange), the Fakahatchee Strand, Sixmile Cypress Slough (Lee County), the St. Johns River, in the Natural Areas Teaching Laboratory at UF, Clear Lake (Alachua), and more. 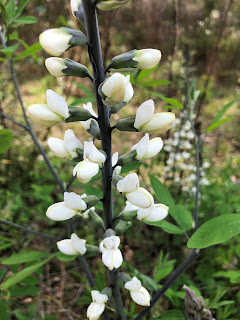 If you're out in the dry pinelands and sandhills of North Florida right now you might be blessed with seeing the blooms of the White Wild Indigo, Baptisia alba. White Wild indigo is a handsome member of the Legume family. Standing at over 3 feet tall, this spring bloomer waves above the surrounding vegetation and is very attractive to pollinators. There are nine species of Wild Indigos or Baptisias in Florida. Wild White Indigo(B. alba)is in the B. alba - B. tinctoria Cladeof the Genus Baptisias. This means that it is more closely related to Apalachicola Wild Indigo, Baptisia megacarpa, than any of the other seven species of Wild Ingidos in Florida1. White Wild Indigo is occasionally available from native nurseries and Jaret Daniels recommends it as a pollinator-friendly wildflower for use in naturalizing roadsides2. Make sure you are buying a Florida ecotype of this plant, as its natural range is throughout the Eastern US3. 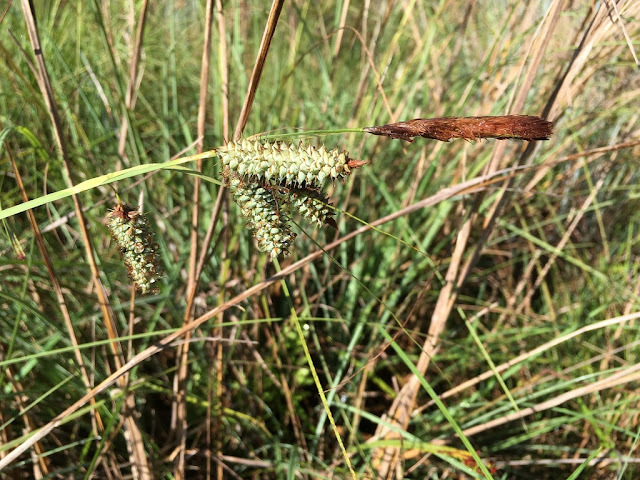 Southern Umbrella-Sedge (Fuirena scirpoidea) is now blooming. This species is often found on marsh and pond edges throughout Florida. F. scirpoidea was described in 1803 by botanist Andre Michaux1. It is vouchered for most counties in Florida and occurs throughout the southeast United States. 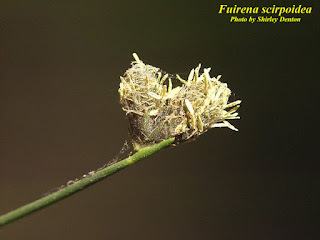 The genus Fuirena was first described in 1773 by Christen Friis Rottbøll, a Danish botanist2. Fuirena is within the tribe Fuireneae which is in the Cyperoideae subfamily and finally within the Cyperaceae family. 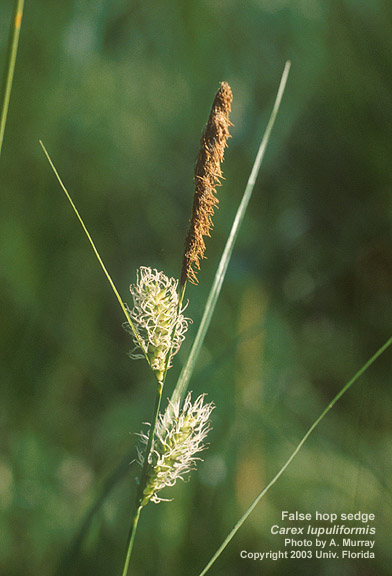 This means it's more closely related to the Saltmarsh Bulrush (Bolboschoenus robustus) than any other sedge in Florida3. The FWC and UF/IFAS CAIP have a how-to video for identification. It does not appear to available in cultivation for use in a rain garden, bog, or wetlands restoration4. You may be noticing a small white flower popping up in your lawn and/or on roadsides, that may be Oakleaf Fleabane, a common native wildflower in Floria and throughout the Southeastern US. Check out our growing guide here. This flower appears to be a favorite of the small native pollinators: sweat bees, small skippers, and nearly invisible flies. E. quercifolius is in Section Quercifolium of the Genus Erigeron, which means that it is more closely related to Erigeron species in the Western US and Central America like the Rio Grande Erigeron (Erigeron tenellus) and Darrel's Fleabane (Erigeron darrelianus) in Bermuda than it is to the other native species of Erigeron in Florida (E. annuus, E. pulchellus, E. strigosus, E. tenuis, and E. vernus)1,2. 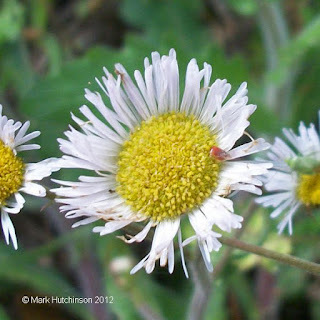 Oakleaf fleabane is occasionally available from native nurseries. If you yard is moist enough, you may be able to see some if you delay mowing in the spring. Illicium floridanum is Florida Anise, which is documented in the FL Panhandle and further west along the Gulf Coast.